Let’s continue with our discussion of string theory from last week, which says that all matter can be broken down to a fundamental particle, called a string. Atom are made up of protons, neutrons, and electrons. Electrons aren’t made of anything smaller. Protons and neutrons can be broken down further into quarks, which also can’t be broken down any further. For this reason, quarks and electrons are referred to as fundamental particles. Even though quarks and electrons behave very differently, string theory says that they are actually very similar, and that the differences between them are due to these strings vibrating at different frequencies, similar to how a violin makes different sounds. The most interesting thing about string theory is that it requires extra dimensions of space. These curled-up dimensions are too small to see or experience. There are a great many ways of curling up these extra dimensions. String theory require seven extra curled up dimensions, so when added to our three familiar dimensions of space plus time we get a total of 11 dimensions. You can think of multi-dimensional space as a garden hose. If the hose is viewed from far away, it appears to have only one dimension—length. Now think of a ball small enough to enter the hose. Such a ball would move more or less in one dimension. However, viewed close-up, one discovers that the hose contains a second dimension—its circumference. For an ant crawling inside, it would move in two dimensions. This extra dimension is only visible when up-close, or if the ball we use is small enough compared to the hose. blue areas are colder by about 0.0002 degrees. It might be possible to detect gravitons indirectly. Remember, gravitons are the hypothesized fundamental particles that carry the force of gravity. Experiments are in progress to detect gravitational waves and although these experiments cannot detect individual gravitons, they could provide information about gravitons. Gravitational waves were hypothesized by Einstein whenever two massive bodies are in tight orbit with one another, such as the binary white dwarf stars discusses previously in this column. At the Large Hadron Collider (LHC), scientists will soon be ready to run at energies high enough to allow for the testing of extra dimensions as predicted by string theory. The thinking is that if they can smash particles together at high enough energies, part of the collision debris might escape into an extra dimension. By calculating the total energy before and after such a collision, they can see if less energy is present after the collision. If so, it could mean that energy is flowing to an extra dimension. 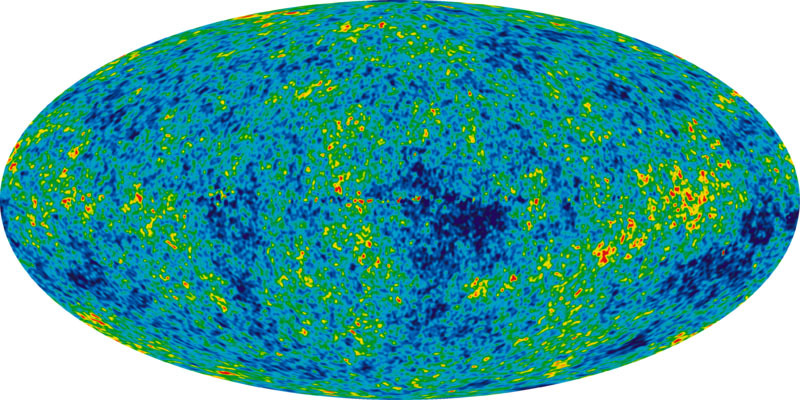 The Cosmic Microwave Background (CMB) radiation might also contain clues about strings. It is interesting to think that in the first moments after the big bang, all the matter of the Universe was contained in an extremely hot, dense stew of fundamental string particles. If so, we might be able to look for an imprint in the background radiation as the universe inflated. NASA’s Wilkinson Microwave Anisotrophy Probe (WMAP) has been gathering information about the nature of the Universe for nine years, finishing in September 2010, and has provided us with some fascinating information, mapping the CMB radiation to produce a map of the microwave sky, revealing what the Universe went through during the first trillionth of a second (inflation). The Planck space observatory, a project underway by the European Space Agency, will improve on this by a factor of three and is scheduled to deliver final results near the end of 2012.